At the beginning of the week I was not feeling too well so I took it quite easy. Rested on Monday, ran 13k on Tuesday (with no energy at all) and then rested again on Wednesday. On Thursday I was feeling myself again and went to do some uphill repeats in Richmond Park. I first did a 3k warmup and then five 400mt uphill and then rested 400mt downhill. Quite intense. On the way back home I also did some sprints instead of just doing a cool down. In the evening I went to another Like The Wind event where The Montane Spine Race movie was shown. I liked it a lot. See the trailer below and if you get a chance to see it do not miss it. The film makers were there to answer questions, one of the runner was there too to tell us about his experience. All in all a very nice evening. On Friday I took it easy. I ran 11.5k at 4:48 in Bushy Park. Very strange morning, very foggy. At one point a white stag ran out of the mist and into the bushes, quite spectacular. Saturday I finally managed to go for a run with Craig. We have meant to go for a run together since last year, preparing for the NDW50. We never managed to until this week. We ended up doing 32km from Kingston to Mortlake and back. We did not go too fast but I was very tired at the end, maybe it’s because I am not used to talk so much while running. We then went for a cold beer on a river pub, in the sun, it went down really well (I had a killer hiccup in the evening, but that’s nothing new). Craig: nice one, let’s do it again. Then on Sunday I went to explore new trails. 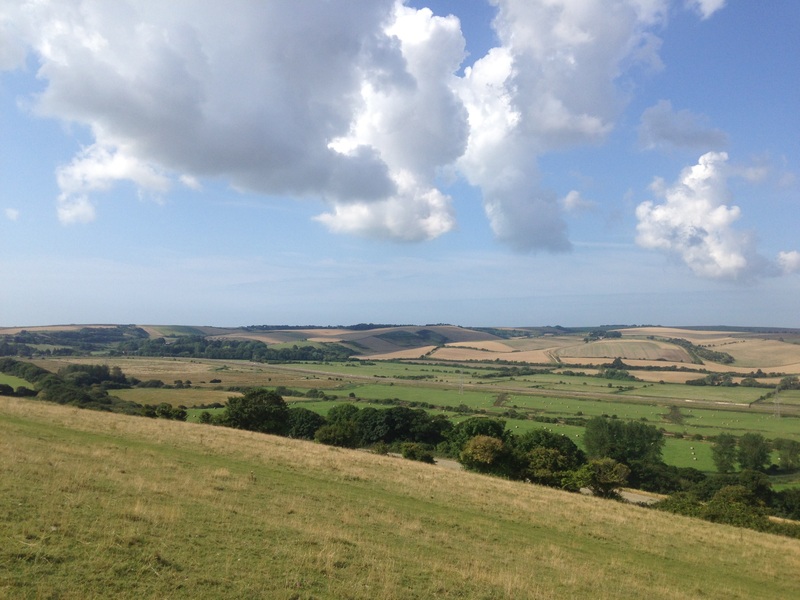 I have never run on the South Downs Way. I have walked part of it, but had not seen enough. So I woke up very early, 5 am, drove down to Eastbourne, left the car there and then took a train (2 actually) to Falmer and then looked for the SDW. 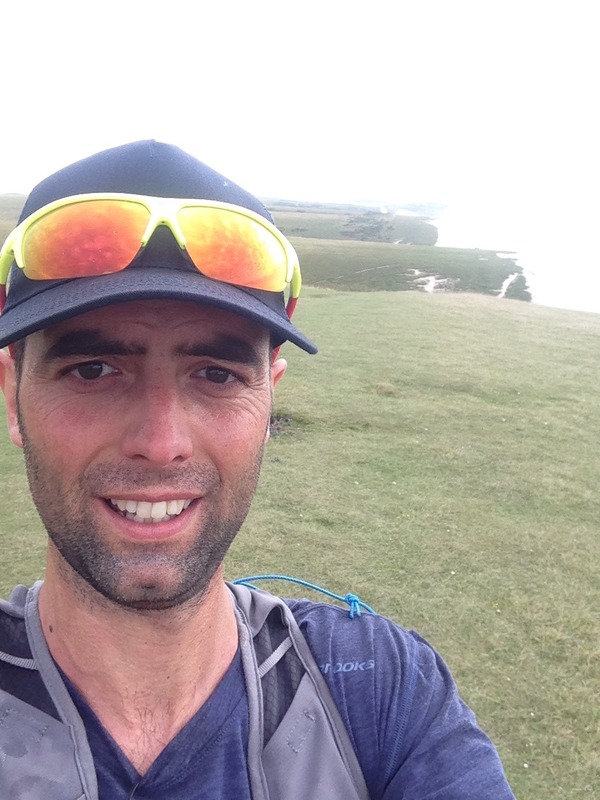 The plan was to run the second half of the SDW50 which I will race next year. Falmer is perfectly halfway and the train station is close to where the SDW meets the A27. I started running straight outside the train station but after less than 2k I stopped as my watch had all the settings reset from the previous firmware update and it was in miles and showing me data I did not want to see etc. I did not want to run 40k+ without the right settings so I stopped, fixed the issue and started again. What I did not notice was that where I stopped I should have crossed the A27 and go into the SDW, instead I kept running on the side of the road until I arrive to Kingston Near Lewis where I asked a friendly lady how to find the SDW. I was not too far, I only had to climb a hill and I would cross it. The sun was shining and it was quite hot. I knew it was going to be a long run and I was still a bit tired from the day before so I forced myself to take it easy. I also knew I was not going to cross much civilisation and there was no point in going back or taking shortcuts. The car was at the end of the trail, I had to run it all. 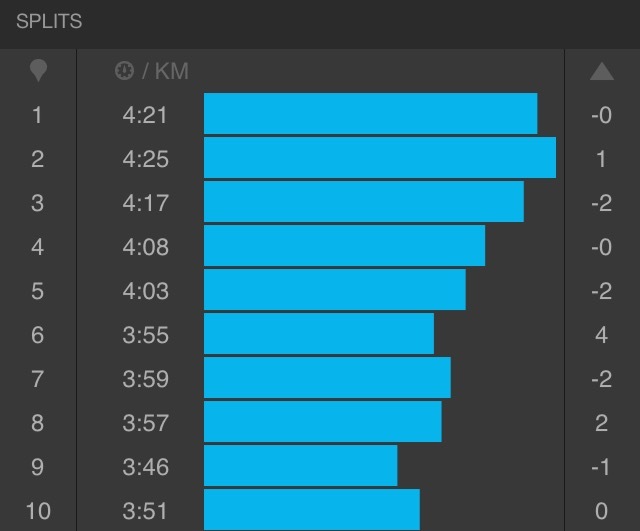 It was quite a good exercise in pacing and I am very happy I managed to be consistent. I never felt like I was going to crawl. I ran well on flat and downhill and run most of the climbs. The view from the top of the various hills was amazing. 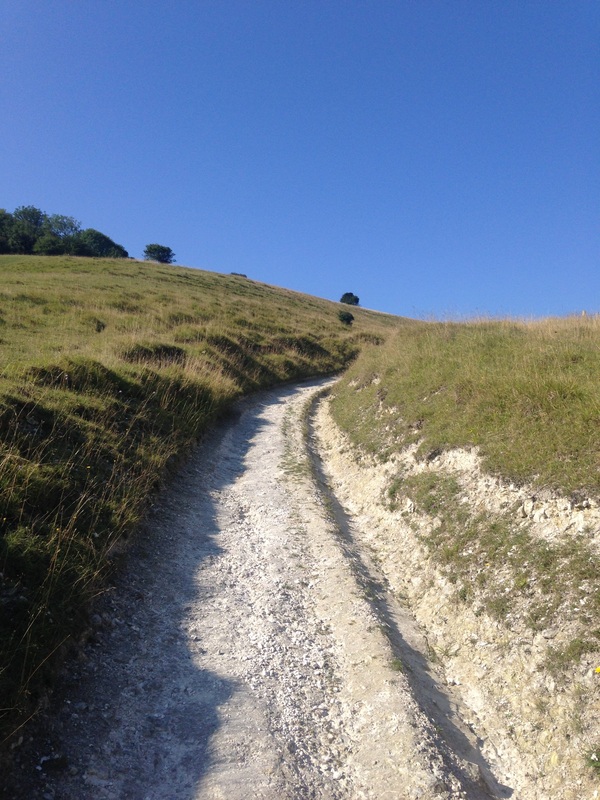 I have to say, I like the North Downs Way, but on a day like Sunday, the SDW is ten times better. I steadily kept on going. I did not force myself to eat too many gels and my stomach was happy. I might try not too eat gels every half hour during races like I always try to do. 45 minutes, an hour is probably good for me. It started getting cloudy and windy and at times it felt quite chilly. I had a jacket with me in case I needed it, but I did not use it. I felt that if I kept on moving I was not going to get cold. Another reason to keep going. At times I felt very far away from everything. I met people walking around but it felt very lonely at times, me versus nature. I listened to some music and loved the whole feeling. 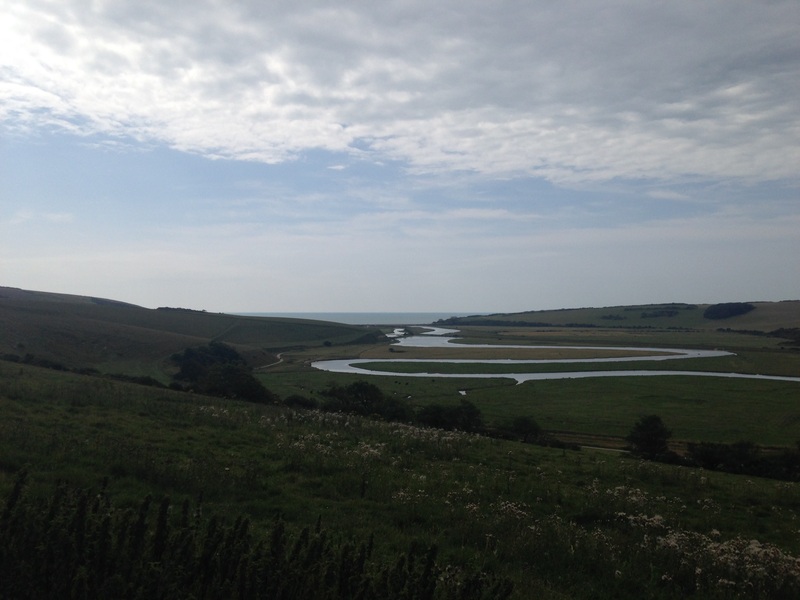 At the 24th km I arrived at Alfriston. Looking at the map the days before I had planned to stop here to refill the water bottle and maybe get some quick food. The village centre is really nice and tiny. I went into the only little shop I saw and bought 1 litre of water, a packet of crisps and a box of jaffa cakes. I had run out of water half an hour earlier so I was quite thirsty and drank half a litre straight away and ate the crisps in two seconds and then started running again. I think I stopped for 5 minutes but it was enough to give me strength. I knew I was over the halfway mark. While running I ate some jaffa cakes. They work really well for me. I carried the packet almost until the end and I ended up having an orange hand at the end. After 4 more kms and a couple of tough climbs/step I arrived at Exceat. A place I know well as I walked there a couple of times. It is very touristic and was packed with people. Knowing the area made me fell like I was almost at the end, but the toughest 10 miles were waiting for me. Running up and down the Seven Sisters is really hard. I walked 2 climbs but ran all the others. 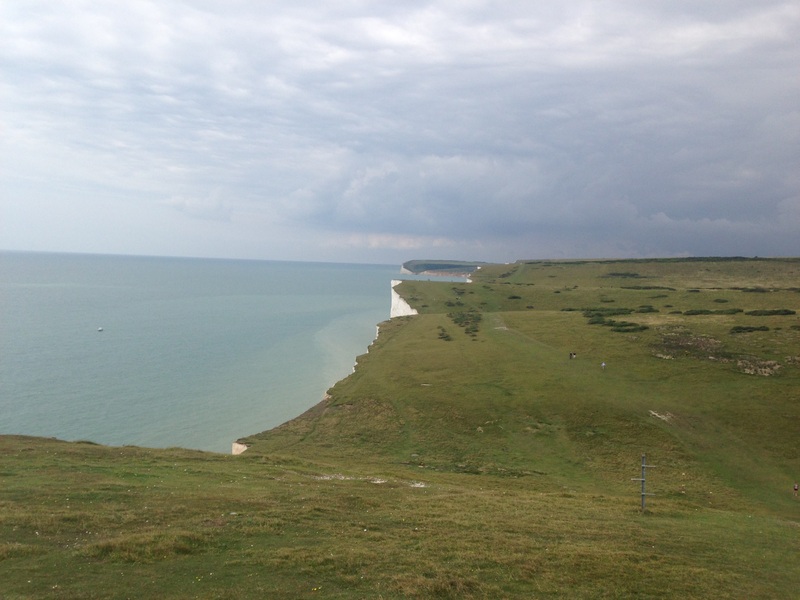 Very tough after 35k, I cannot imagine how it will be at the end of the SDW50. The view from there, even without the sun, is amazing and it makes you forget how tired you are. I finally ran into Eastbourne. Did a couple more kms in town and then stopped. I had run 43.5k in total and I had enough. I wanted food. Unfortunately the town was over crowded due to an airplanes show or something. I was hoping to get a shower on the beach and then go for some fish and chips, but you could hardly walk around. Too many people. I bought a massive cappuccino (proteins! 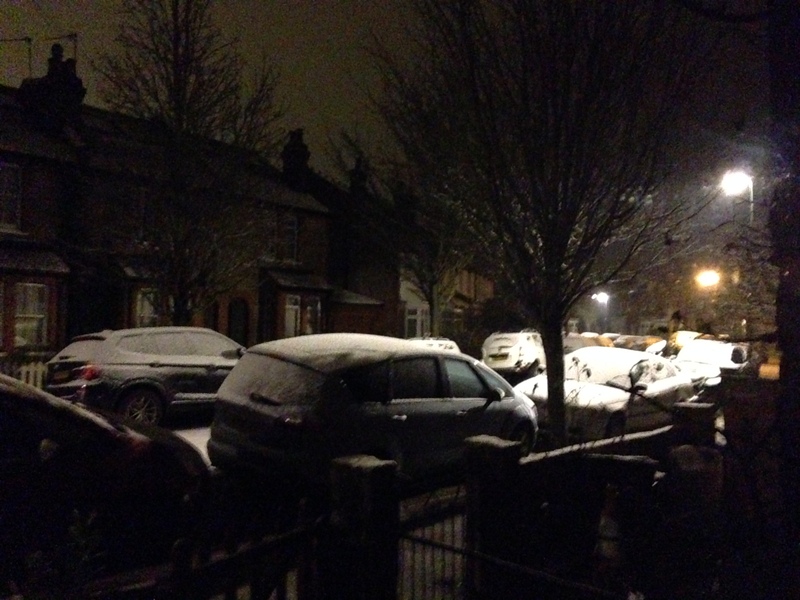 ), had a banana and some snacks and drove back home. Happy. Overall a very good week. Two nice long runs in the week end, one in good company and one in beautiful settings. I ran a total of 105km. 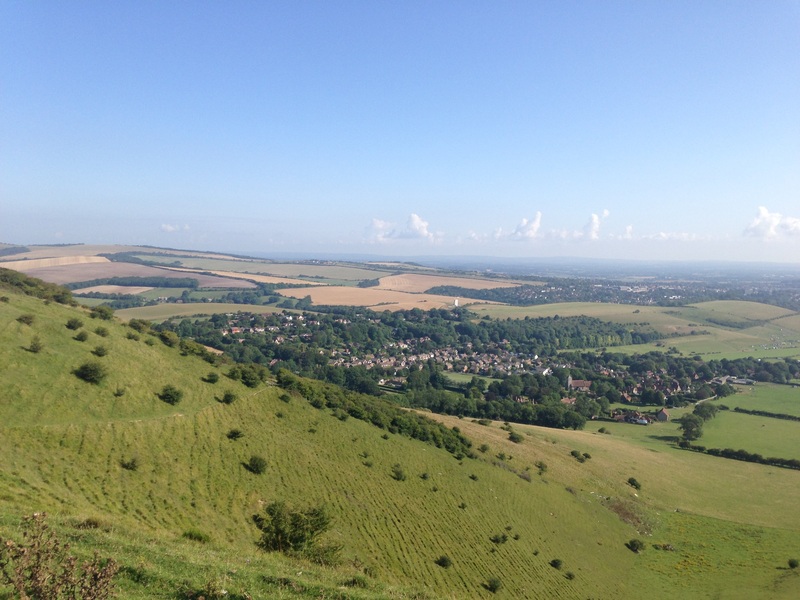 Next week I will rest a bit and then start the build up for the next race in September: the High Weald Challenge 50k. This week has been great (apart from the never ending cold and light flue). Being on holiday meant I could go running whenever I wanted and not in the dark. I wanted to put some kms in my legs before the tapering week before the marathon (on the 10th Jan) and I ended up running a total of 103km in 5 runs, which is my weekly record. Monday I did 20km going around Bushy Park and then to Kingston via Hampton Court. Beautiful frozen sunny morning. The park was at its best. White grass, a little fog, the yellow sun coming up behind the trees and lots of deer. Very poetic. I did the first 15km at an easy 4:20/4:30 pace and then did the last 5k at around 4:00. Very nice. The heart rate monitor did not work. I spent an hour trying old ones and different straps with no luck. I need to get a replacement. On Tuesday I did another easy run. This time 15km long. Again in freezing conditions, around zero degrees. When I entered Bushy Park it felt more like -5, running through a wall of freezing fog. On Thursday, being the last day of the year, I decided to go for a long run and maybe aim for the marathon distance. I did not manage to. I did 40km, but I could not do more. I have to respect the distance a bit more and start running slower at the beginning. It was a good lesson for next week. I ran with an average pace of 4:53 min/km which I think is a fine pace to aim for, but I should not do the first part at 4:30 and then end up doing the last kms at 5:30. Anyway it was a good run. I went through all the nearby parks, Bushy, Richmond and for the first time in ages Wimbledon Common. This last one is a lot of fun, I randomly took paths to see where they took me. There is quite a lot of up and downs there, it is a good training ground, I should go there more often. I used this run as a test for next week and went out with the Ultimate Direction AK race vest carrying one bottle of water, 3 gels and all the required kit for the next marathon (jacket, first aid kit, thermal blanket etc). I had no problem at all. Apart from the socks which ended up with a hole in them I am now 100% sure of what I am going to wear next week, including which pants! Thursday I rested and then on Friday did a slow recovery run (17km at 4:40 min/km). After the long run earlier in the week this one felt too short and when I got to 12km and was supposed to turn for home I decided to run a bit more to the Teddington Lock. On Friday even if it was raining and cold and I was still a bit ill I had to go out and run. 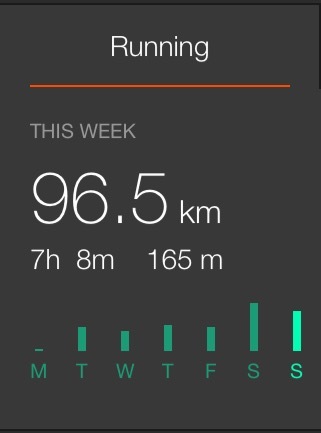 I was too close to the 100km week not to go. So I went out for an easy 11km run but then I decided to push a bit on the last kms. As I have not done any speed work for the last 2 weeks I decided to run a bit faster and did the last 4 kms the way I like it (4:02, 4:00, 3:46, 3:39). I felt good. Actually I have never been in such a good shape, even doing warm ups and stretching I feel strangely athletic, different. I could not be more ready for next week’s trail marathon! To sum it up, it has been the best running year ever. I started with the plan to run more during the week (from 3 to 4 times a week) and to run more half marathons. I ended up running 6 times a week and preparing for an ultra. I wanted to do PBs on 5k, 10k and 21.1 km and did them multiple times and I wanted to aim for a marathon. In 6 days I will have achieved that too, hopefully. And 3 Bushy Park Runs. But the best part is the new found love for trail running and setting crazy new goals like doing 3 marathons in the next 3 months and my first 50 miles ultra in May. This has basically changed my life and I cannot wait to see where this leads me. 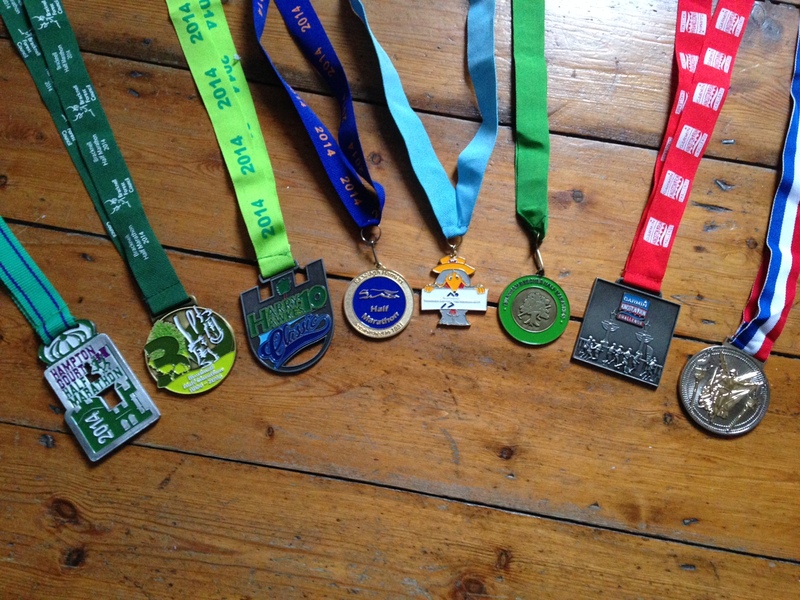 I still have to decide what to do the rest of the year after the NDW50. For all the fun and “successes” of 2014 I have to thank the support of my family that has not got bored of hearing me talking about running every second (yet) and my running friends Marco R., Davide G. and Manu. I am looking forward to running with you guys in 2015. Have a wonderful 2015 and I hope you can all reach your goals, whatever they are.